Last year we purchased a rechargeable torch for when we walk the dog at night. It was utter rubbish. A 20 hour charge only last 20 minutes. This winter we decided to replace it with a wind-up torch. 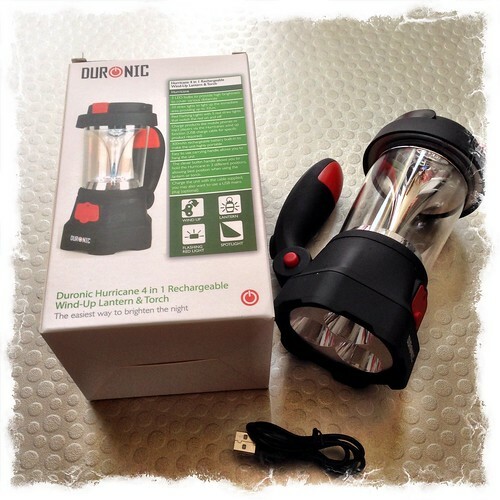 After searching on Amazon I decided on the Duronic Hurricane 4 in 1. Duronic Hurricane 4 in 1 arrived the next day after I ordered it. I’ve used it a few times now and it works very well. The torch is nice and bright and casts a good beam of light. The lantern is also very bright and will come in useful if we experience any power cuts. There is also a red flashing light. Not really sure what use it will be for me. You can also charge your phone etc. via the built-in USB port. A very handy little feature. This entry was posted in Gadgets and Tech and tagged Duronic on November 5, 2014 by Richard.